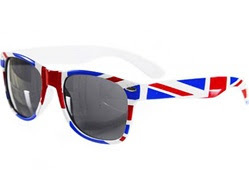 These Union Jack adorned Jimmy Choo Alex sunglasses retail for $275 at Zappos. Although they have some differences, these sunglasses from Sarah Aghili will give you an inspired by look for a lot less cash. They retail for $7.90 and you can click HERE to view or purchase.